Why I Loved It: Culture Club struck gold with Colour By Numbers, easily their best album both commercially and critically. Without question is it one of the most trendy albums of the decade. With four huge hits in the United States, this album was a mainstay on both the radio and MTV and for good reason – their songs were catchy, whether you chose to admit it or not. “Karma Chameleon” was irresistible then and still so to this day. It checked in at No. 38 on my Favorite 100 Songs of the 80’s countdown last year. Good luck hearing that come on and not commencing in some whack dancing. 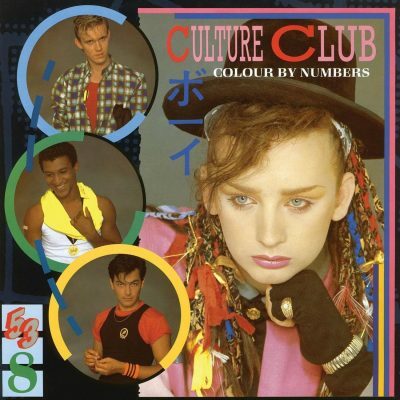 While “Karma Chameleon” sort of gives you the expectation that nine more tracks of goofiness will follow, Colour by Numbers is essentially an album filled with solid, fashionable, urbane new wave songs with killer hooks and top of the line production. The only thing I didn’t like about Colour By Numbers is that album cover is unbelievably corny. Seriously, it’s whack “AF”. Commercial Success: Their sophomore studio effort, Colour By Numbers was a success not just in the United States but around the world. The album has sold more than 16 million copies worldwide including over four million in America. It reached number one in Canada, Japan, New Zealand and the U.K. but had to settle for number two on the United States Billboard Top 200, finishing 1984 at five on the year-end chart. “Karma Chameleon” went to number-one on the Billboard Hot 100 and to date is the group’s lone number-one hit in the United States. According to the Wiki it’s the 31st biggest selling single in the history of the United Kingdom. “Miss Me Blind” maxed out at five on the Billboard Hot 100, was the group’s sixth consecutive top 10 single and also their last. “Church of the Poison Mind” reached No. 10 on the Billboard Hot 100 and he last single released from the album, “It’s a Miracle” peaked at No. 13. “Victims” charted high in the U.K., Australia, Irish and Italy but not America. This is the second Culture Club album to hit this countdown — Kissing To Be Clever entered previously at No. 86.